He was a member of the marching band and on the track team (his event was the running long jump) at Dana Junior High School in Arcadia, CA which he attended from 1967-1969. As a teenager, Mike developed an interest in the guitar. However, since many of his friends already played either guitar or drums, he instead picked up the bass. His first bass was actually a Fender Mustang guitar owned by Mike Hershey, who he would later go on to form a band with. Mike relieved the guitar of its top two strings and used it as a bass. Though he is left-handed, Michael plays bass like a right-handed player does. A short time later, Mike’s father sprung for a Victoria P-bass copy and a Gibson amp that he picked up at a local flea market. Michael’s influences include Electric Flag’s Harvey Brooks, Cream’s Jack Bruce, and his main man, Led Zeppelin’s John Paul Jones. By 1966, Mike’s family had moved from Chicago to California twice, before finally settling in Arcadia. As a youth in Arcadia, Mike was a promising baseball player (he played catcher), but chose not to pursue baseball after starting highschool so he could devote all of his time to playing music. Mike’s first band was Poverty’s Children and featured himself on bass and lead vocals, his brother Steve on drums and Mike Hershey on guitar. Other early bands he played in included Black Opal, Balls and Snake. Snake was a three-piece rock outfit that featured Michael on lead vocals and bass, Tony Codgen on guitar and Steve Hapner on drums. Their set lists included tunes by ZZ Top, Lynyrd Skynyrd and Foghat along with their own original tunes. 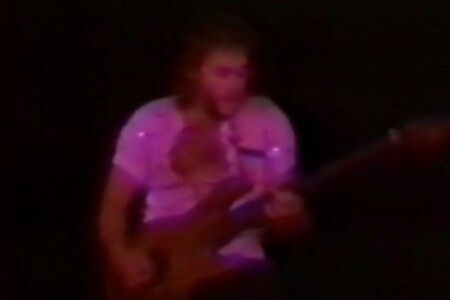 Snake played the same backyard party scene that Mammoth played (one of the Van Halen brothers’ early bands that featured Edward on lead guitar and vocals, Alex on drums and Mark Stone on bass) and even opened for them one night at Pasadena High School in Pasadena, CA. That evening, Mammoth’s PA system failed and Mike lent them Snake’s PA.
After high school, Michael attended Pasadena City College where he was pursuing a degree in music. Alex was attending classes at the same time, and Mike would often see him on campus going to and from class. Michael planned on attending college in Santa Barbara, CA after his stint at Pasadena City College, but dropped out a few credits shy of his degree at PCC to devote all of his time to Van Halen, who had changed their name from Mammoth a short time earlier, due to the fact that another band was already using the Mammoth moniker. Van Halen assaulted the Southern California club scene over the course of the next few years and established themselves as one of the premiere rock and roll bands in the area. By 1978 they’d released their first album on theWarner Bros. label and the rest, as they say, is history. 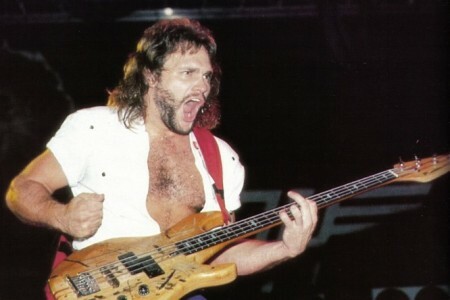 In addition to his thundering bass lines, Michael’s melodic and instantly recognizable backing vocals play a huge part in the unique sound of Van Halen. He is responsible for many of the ear-shattering squeals and screams found throughout the band’s albums. As a connoisseur of Jack Daniel’s whiskey, Mike was prompted to build a bass in the shape of a Jack Daniel’s bottle. He built the first version along with Kevin Dugan and Dave Jellison, and the Jack Daniel’s company offered to do the graphics for the fnal version in exchange for Mike’s entry into their hall of fame. The guitar made its debut appearance in the video for “Panama,” and was delivered during filming of the video at the Spectrum in Philadelphia, PA. Prior to donating this infamous bass to the Hard Rock Cafe chain, Michael had a backup built. The graphics were done by Jim O’Connor, who also did the graphics for Michael’s Tabasco bass (seen on 1988’s Monsters of Rock tour), as well as the striped face plates for Edward’s Steinberger guitars. Michael’s bass solo has always been nothing short of spectacular. Over the years, it’s evolved from a mind-numbing theatric excursion to a jaw-dropping technical display. Whether launching his bass from the risers and stomping it into the ground, throwing in a little humor by adding the Bonanza theme, kicking things off with Bach’s Toccata and Fugue in D Minor or the sonic crush dubbed ‘Ultra Bass,’ you never know what the man is gonna throw your way. And that’s just the way he likes it. The backup Jack Daniel’s bass was even brought out of retirement on the III Tour. Mike played it during “Somebody Get Me A Doctor” – his solo spot that featured him on lead vocals, which became an instant crowd favorite. Michael has several other interests outside of music. He has a passion for hot rods and race cars. Some of the beauties in his stable include a 1932, 1933 and 1940 Ford hot rods. His pride and joy is the 1940, nicknamed “Ragen ’40.” This custom-built Boyd convertible took 17 people nine months to assemble and features a Corvette LT4 engine, leather interior and an over the edge stereo system. The mighty bassist also collects hot sauce and watches. He has more than 80 watches in his collection, including more than 60 Mickey Mouse watches!